Rafael Nadal opens his Melbourne campaign with a win over James Duckworth. The 107th edition of the Australian Open began on a hot and scorching summer Monday in Melbourne – sunny and 28º Celsius at the start of play with a high expected to reach 34º – amid the excitement and buzz that always accompanies the year’s first Grand Slam. With both a global TV audience tuned in at all hours of the day and night as well as plenty of fans packing the show-court arenas and outer courts, the Happy Slam offered many big names for Day 1 – among them, Maria Sharapova, Rafael Nadal, Julia Goerges, Kevin Anderson and Sloane Stephens, who saw action during the day session. Opening day got off to a quick start for the women as the No. 11 seed Aryna Sabalenka, playing in just her sixth Grand Slam main draw, looked both comfortable and fierce in easing past Russian qualifier Anna Kalinskya, 6-1, 6-4, in just 66 minutes. In the second completed match, No. 30 seed Maria Sharapova served up a double bagel, 6-0, 6-0, over British qualifier Harriet Dart in the first match of the tournament on Rod Laver Arena, site of her 2008 title victory over Ana Ivanovic. Also, No. 5 seed Sloane Stephens easily won over fellow American Taylor Townsend, 6-4, 6-2; No. 19 seed Caroline Garcia defeated French qualifier Jessika Ponchet, 6-2, 6-3; No. 24 seed Lesia Tsurenko beat Ekaterina Alexandrova, 6-4, 7-6 (4); No. 29 seed Donna Vekic defeated Kristina Mladenovic, 6-2, 6-4, and No. 31 seed Petra Martic advanced over Heather Watson, 6-1, 6-2. Sabalenka, who two weeks ago lifted the trophy at Shenzhen, needed just 66 minutes to advance to the second round. She fired five aces, hit 25 winners and and broke Kalinskya three times. Meanwhile, Sharapova advanced in just 63 minutes over the outmatched 22-year-old Dart, one of seven British players in action on the first day, who was playing in just her second Grand Slam main draw. Sharapova broke her opponent six times and hit 20 winners while keeping her own unforced errors to just 16. She missed just one return in the match, winning 35 of 36 for a 97 percent efficiency. “It’s been many years since I won the trophy here,” said Sharapova during her post-match press conference. “Despite my opponent not having the best day, I still had to get the job done today. I love what I do, I love competing and challenging myself to get better. The first upset of the women’s draw occurred during the opening match on Margaret Court Arena as No. 14 seed Julia Goerges lost to No. 35 Danielle Collins, 2-6, 7-6 (5), 6-4, despite hitting 47 winners and outpointing her opponent 103-99 during their 2 hour and 25 minute match. Goerges, champion two weeks ago in Auckland, was two points from victory over Collins at 6-5, 30-love in the second set, but was unable to close it out. It was the first win in a Grand Slam for Collins after starting 0-5. Also, the first super tiebreak in Grand Slam history occurred on Monday afternoon. The final-set, best-of-18-point (first to 10) tiebreak recently adopted by the Australian Open came into use during a first-round women’s match between Katie Boulter and Ekaterina Makarova, which Boulter won, 6-0, 4-6, 7-6 (10-6) over the 2015 semifinalist. Boulter, making her main draw debut, thought she had won it at 7-4 and began to prematurely celebrate. Then, she finally won it at 10-6, to earn a second-round berth against Sabalenka. When you think you’ve won the final set tiebreak but forget it’s first to 10. On the men’s side, World No. 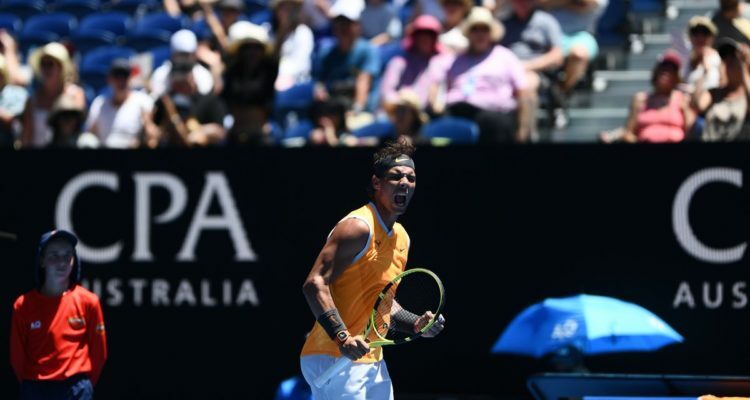 2 Rafael Nadal sported a new, colorful Nike orange-colored sleeveless top and played solid throughout much of his opening-round win over Australian wild card James Duckworth, 6-4, 6-3, 7-5. Nadal won in a tidy 2 hours and 15 minutes that was sealed with an emphatic two-fisted backhand winner. In the No. 2 seed’s first match since the U.S. Open, Nadal hit 38 winners and committed just 11 unforced errors against the No. 237 Duckworth. Meanwhile, No. 5 seed Kevin Anderson, a recent champion at Pune, remained unbeaten in 2019. The South African advanced over Adrian Mannarino, 6-3, 5-7, 6-2, 6-1, in 2 hours and 53 minutes, by firing 14 aces, winning 75 percent of his first serves and smacking 47 winners. Also, No. 14 seed Stefanos Tsitsipas, who won last year’s Next Gen ATP Finals title, rebounded for a 6-7 (3), 6-4, 6-3, 7-6 (4) win over Matteo Berrettini; No. 19 seed Nikoloz Basilashvili beat American qualifier Chris Eubanks, 6-4, 4-6, 7-6 (6), 6-3; No. 20 seed Grigor Dimitrov defeated Janko Tipsarevic, 4-6, 6-3, 6-1, 6-4; and No. 26 seed Fernando Verdasco advanced over Serbian qualifier Miomir Kecmanovic, 7-6 (5), 6-3, 6-3. • “He was always my favorite, and I think it will be a huge loss for tennis in general, but also for the WTA. Because even nowadays, when you think everything is equal, you still need men, especially successful men, to speak up for women.” – Andrea Petkovic, German WTA player. • “He was thoroughly decent, profoundly fair, deceptively funny and far more liked and colorful than he was ever given credit for.” – Jon Wertheim, executive editor and senior writer, Sports Illustrated. • “The entire universe has deluged Andy Murray with so much love. And he deserves it.” – David Law, BBC5 Live commentator and co-host of The Tennis Podcast. • “The most human and honest and emotional champion in this era. To see the joy on his face when he won Wimbledon and to see the pain now as he plays. The people’s champion.” – Chris Evert, Hall of Fame player and ESPN analyst. Murray, whose ranking has fallen to No. 230 in the world, was scheduled to play his first-round match in the 2019 Australian Open on Monday night against No. 22 seed Roberto Bautista Agut of Spain on Melbourne Arena. “The tour is a clash of generations, with Serena Williams, 37, and Venus Williams, 38, still in the mix along with mid career champions like Angelique Kerber, 30, and Caroline Wozniacki, 28, and the new wave led by Naomi Osaka, 21, the Japanese sensation who upset Serena Williams to win the United States Open last year. It is rare to see such a range of players clashing with the outcomes so uncertain. “The tour has geographical breadth, with players from the United States, Europe, Asia and Australia all in the top 20 and with Ons Jabeur, 24, of Tunisia in the top 60 after last year, becoming the first Arab woman to reach a WTA final.” – Christopher Clarey, New York Times tennis columnist, on how finesse is making a comeback in women’s tennis. • “Tennis is a game of chess, of tactics. You have to vary zones and trajectories and find the answer suited to what your opponent is doing. To have women who play well tactically and who can keep the ball in play, while varying and creating, makes the show much more interesting for people, in my opinion.” – Philippe Dehaes, Daria Kasatkina’s coach, as told to Christopher Clarey of the New York Times. • “I think I really understand my body very well. I know when something hurts and I can play with it; I know when something hurts and I should not play with it, but I can still play maybe a match, maybe a week, a month, whatever it may be. Sometimes that helps. But I feel like every player has that. I can only speak about my team. I think my team also, they know when to push me, when actually they are happy that I don’t practice so much.” – Roger Federer, during his pre-tournament press conference in describing his extraordinary career that’s been relatively free of major injuries. • “The challenge is also to keep improving her game, because if she doesn’t, she will never break that record.” – Patrick Mouratoglou on Serena Williams’ pursuit of Margaret Court’s all-time record, as told to Reem Abulleil of Sport360.com. “What should we call these tie-breaks? I don’t like ‘match tie-break’ much. With ‘champions’ tie-break’ I never know where to put the apostrophe, or even whether to drop it. ‘Super tie-break’? They don’t think of things like this in the boardroom when they make these calls!” – Simon Briggs, British tennis writer, “The Telegraph”.